Next week’s theme: Freestyle! Whatever you want! I’m so embarrassed to be first because a) my “milestones” haiku is beyond the polar opposite of Jenn’s lovely sentiment and b) my comment pales next to all of the brilliant regulars. .-= stephanie (bad mom)´s last blog ..now like then =-. .-= Thom´s last blog ..The Happy Smiley Test and The Harley-Davidson Facts =-. a very very Happy Anniversary! big hugs! both of you are so very blessed! .-= fickle´s last blog ..Senasational Haiku — Milestones =-. .-= PinkLady´s last blog ..Milestones (Haiku) =-. Happy Anniversary! 19 years! Wow! Congrats! Sorry I am late! I hope you’re enjoying your anniversary celebration. 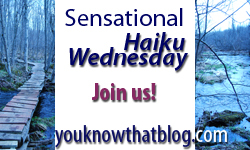 .-= quilly´s last blog ..Sensational Haiku Wednesday ~ Milestones =-. Happy anniversary, Jenn!! I hope you guys had a great mini-break :) Nineteen years….wowzers!!! Congratulations! Here’s my late submission for this week (where the heck is Knarf?!?). Day’s end. Finally posted. Come on over! .-= Magical Mystical Teacher´s last blog ..Haiku Wednesday: Milestones? =-. Happy Anniversary, Jenn. What a wonderful milestone. I hope you have a great time. This is my first time to join your fun. Thanks for hosting this meme. Have a wonderful week. .-= Rosidah Abidin´s last blog ..Milestones | Sensational Haiku Wednesday =-. Shouldn’t there be more than one? Phew, all is right with the world again!! These are great, Knarf!! 19 years is indeed a milestone. May you have many more great years. .-= Nessa´s last blog ..Flash 55 – Where the Dead Bodies Are =-. that was so sweet… wait …. have to wipe the tears from ….. my eyes! Ha. Very sweet tribute to a 19 year marriage so many folks don’t make it past the first few. Congrats Jenn. I will be coming back to HW if you don’t mind my blogging will be real limited so my time in front of the computer will not get out of control!LOL!